Texas brisket is a very, very special thing. It’s essentially just perfectly smoked bbq brisket with nary a trace of rub. It doesn’t need any accoutrement. It’s just beefy exquisiteness. Here’s how to make it. 1. Remove the brisket from the refrigerator at least 1 hour before cooking. Season generously all over with salt and pepper, packing the coating on well. Sprinkle with garlic, if using, then gently rub over seasoning. 2. Prepare a smoker or a charcoal or gas grill for smoking over low heat. 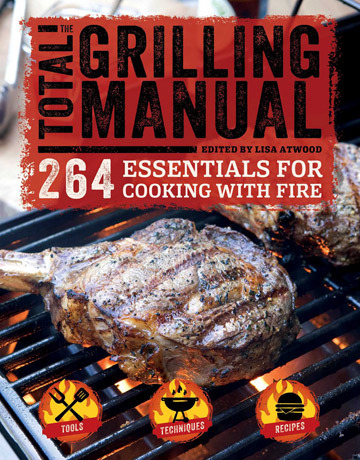 The grill temperature should be 225 to 250˚F (107 to 120˚C). If using charcoal, bank lit coals on either side of grill bed, leaving a strip in the center without heat. Place a drip pan in the center strip and fill with water. Add 1 to 2 cups soaked wood chips to the fire just before grilling. (Keep remaining chips in water until ready to use.) If using gas, fill smoker box with about 1/2 cup chips, then preheat grill. The wood chips should begin to smolder and release a steady stream of smoke. To get more smoke without increasing grill heat, add a few dry chips to the soaked ones. Turn off one or more of the burners to create an indirect-heat zone. Brush and oil grill grate. 3. Place the brisket on the grill, fatty side up, as far away from the fire as possible. Cover and cook 4 to 6 hours, or until an instant-read thermometer inserted into the thickest part of the meat registers 150 to 170˚F (66 to 77˚C). Check the wood chips every 30 to 45 minutes, adding more chips by the 1/2 cup to keep smoke levels constant. If using charcoal, add lit coals every few hours to maintain heat level. 4. Remove the brisket from the heat and wrap it in aluminum foil. Return to the smoker or grill or place in a 250˚F (120˚C) oven an additional 4 to 6 hours. The brisket is ready when fork tender and an instant-read thermometer registers 195 to 205˚F (91 to 96˚C), 8 to 12 hours total. 5. Transfer the brisket to a cutting board and remove the foil. Let rest at least 30 minutes. Thinly slice across the grain, arrange slices on a platter, and serve at once. Serve with BBQ sauce, whether warm or at room temperature. If you like a nice crusty “bark” on a finished brisket, here’s how to get it: After seasoning the brisket with salt and pepper, don’t pop it on the grill just yet. Place it on a wire rack situated on a rimmed baking sheet, cover loosely, and refrigerate for at least 8 hours (or up to 36 hours). The seasoned coating will dry slightly, leaving a nice crisp exterior on the brisket. Simple perfection. So few ingredients came together to make the perfect brisket. It was so tender and juicy straight out of the foil that you could have cut it with a butter knife and you did not even need the sauce. This is one of those recipes you won’t even want to try to improve. We ended up smoking a smaller brisket—only 5 pounds. If you do this, reduce the portion of rub appropriately as it will end up too salty or peppery and is perfect as written. We have a grill with an offset smoke box so the smoke and heat are truly indirect. We used hardwood charcoal and soaked mesquite chips. To get more heat about halfway through the cooking process we used a charcoal chimney starter to ignite a new batch of charcoal to add to the existing. Simply adding charcoal to the existing firebox did not seem as successful as it did not always ignite quickly. This helped maintain the temperature between 225 to 270 degrees. It took 5 ½ hours for our internal temperature to get over 150. We took it off about 155 degrees and transferred it to the oven. By this time our time management caused a problem…it was late at night. We still put the brisket in the oven but set the oven to go off in a 4 hours. At 4:00 in the morning my husband removed the brisket from the oven and set it on the counter. About 6:00 that morning he unwrapped the foil. The recipe had called for unwrapping the brisket to rest for 30 minutes but ours rested in foil to 2 hours. This small error did nothing to hurt the outstanding flavor and tenderness of the brisket. Reheated later it was still amazing but the succulent tender flavor when originally cut was superior to the reheated version. That night we served this to a group including a true BBQ master and Texan who agreed this Texas brisket recipe was a 10/10. Looking forward to doing this one again. For our group we made homemade bbq sauce and served the brisket along with macaroni and cheese, fresh corn and several summer vegetable dishes, and salads. At first I considered doing a half recipe but decided to go “whole hog” as it were when my butcher offered me a lovely 10-pound brisket at a special deal for testing. So I gladly spent a day tending to the grill with fabulous results. The rub is very simple and after applying it I did allow it to rest 8 hours in the fridge overnight. I'm not sure whether this made a big difference or not but it did have a decent bark on the meat by the end. My grill may have been a little closer to 270 degrees but that was needed to keep the wood chips smoking. I only had the 2 outside burners on med-low and all other burners were turned off. After 5 hours cooking I turned the burners to low and cooked it for a further 4 hours wrapped in foil. We allowed it to rest for 1 hour. The end result was a meat with a dark bark on the outside and tender juicy meat inside. We served it the first time with a grilled sweet potato salad and a green salad. Three of us took some of the leftovers for lunch the next day. Our second serving was in tortillas with mashed avocado, chopped onions and tomatoes, shredded lettuce and Jack Daniels bbq sauce. I also sent double servings each to the butcher (as a thank you) and a couple elderly family members who couldn't come up to take part in the taste test. The last servings were the tougher bits and bark ends. I chopped those up and will be adding them to a crock of baked beans later on this week. A day well spent. 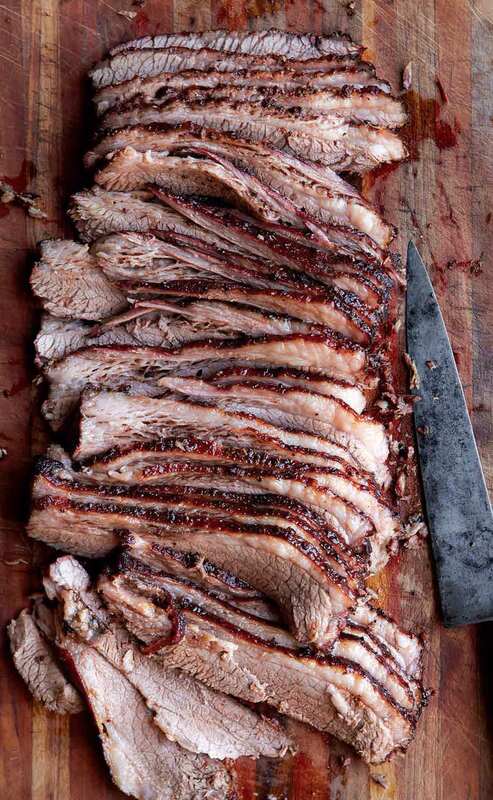 Texas Brisket Recipe © 2016 Lisa Atwood. Photo © 2016 Weldon Owen. All rights reserved. All recipes and photos used with permission of the publisher. Clearly you aren’t from Texas. The proper way to smoke a brisket is to place in the smoker while still cool (to get the best smoke ring) and smoke it fat side down (to get the best bark). We have a few other tips but ‘nuf said. Busted! No, we’re not from Texas, Eric. Although we’ve been around quite a few bbq masters who are. Everyone has their own approach, and we totally respect that. Love putting the brisket in a cool smoker. Brilliant! Thanks! And while we like us some bark, we also like the fat basting the beef while it smokes. At any rate, we are always open to being enlightened as to alternate techniques. Renee, don’t listen to Eric. Texas is a big place, and he must not be from Central Texas. Fat side down is not ideal, and smoke rings don’t indicate much. If you judge barbecue by its smoke ring, you probably also judge a rib by falling off the bone or not. (You don’t want it to fall off the bone, that’s a sign it’s overcooked.) Not everyone can take on a whole brisket packer and a 14-hour smoke. This is a great way to start. So Eric, you might be from Texas, but you are definitely not a gentleman. Burt, bless you. Of course you’re right, Texas is a big place, with room for lots of opinions. Many thanks for your support. And yes, I concur, when you pull ribs from the smoker or oven and the meat is actually falling off the bone, it is a very sad thing. 1. Rub the brisket with brisket seasoning, kosher salt, and pepper. Lots of seasoning. 2. Cook the brisket at 275 for 6 hours in the oven in a baking pan with a half inch of water and a tight cover of aluminum foil. Flip every 2 hours. Till it gets to 160 degrees. The steam from the water tenderizes to meat. The brisket will release lots of juice so don’t put too much or will overflow. 3. Then smoke in a charcoal grill with real wood chunk charcoal uncovered with aluminum foil completely covering the bottom of the meat to prevent the juice and fat dripping from causing a flare up, but completely open on top to get the smoke flavor for 30-45 minutes. Let the fat on the foil fry the bottom of the brisket like bacon frying in a pan if you can. I usually do fat side down and don’t flip it once on the foil as it is too soft already. Time to rest the meat, slice and eat!!! That sounds swell, John! That’s almost exactly how I do ribs, actually. Greatly appreciate you taking the time to share! The way I do my brisket is with pecan wood, it has a lighter wood taste but still I consider a better one. I use the wood that falls from the tree on it’s own, and even the shells from when I have peeled and saved them from previous fall = Pecan Pies !! Love everything about this, Anthony! And I have not a little envy about those pecan trees of yours. Many thanks for sharing your trick!